The Delhi University (DU) Vice-Chancellor (VC) Prof Dinesh Singh and DU Teachers' Association (DUTA) finally broke the ice in a meeting held today after three and a half years of his tenure. On the first day of the admission process for its Four Year Undergraduate Programme, Delhi University (DU) witnessed chaos, mismanagement and even anti-FYUP protests. The Public Works Department has cleared almost all roads of trees uprooted in a massive dust storm on May 30. The violent storm had severely affected traffic and power supply. Delhi Congress leaders today said that the Congress rule in Delhi provided 24-hour electricity unlike the current situation when despite getting more than the required quantity of electricity, people are facing problems. Lieutenant Governor Najeeb Jung today convened a meeting to review the progress of work at the Lok Nayak Hospital, subsequent to his visit and plans to transform it into a model hospital. A 10-year-old boy was allegedly sodomised by eight youths in east Delhi's Geeta Colony area, the police said today. A 24-year-old man, who had to repay loans of about Rs 3 lakh which he had lost in the share market, staged his own abduction with the help of his friend for extorting money from his family. An alleged kidnapper of a six-month-old child has been arrested at Anand Vihar Railway Station. The child has been recovered and handed over to his parents, said an official of the Northern Railway. Two art exhibitions, combining scientific temperament and artistic sensibility, titled 'Impression to Expression', were showcased in the national capital region by two artists. A show of abstract art works inspired by nature at all levels of scale, cosmic as well as nano particle, was put up at Triveni Kala Sangam by Mita Brahma. The meeting assumes significance given the fact that the VC had in the past referred to the DUTA as an "illegal" voluntary teachers' body and that it comes in the backdrop of the concerns raised by HRD Minister Smriti Irani over the absence of a dialogue between them. Irani had also disapproved the manner of functioning of the VC in recent years and raised strong objections on many contentious moves such as imposition of the "code of conduct" on teachers. It is understood that all this while, the VC had been seeking time to meet the HRD Minister, but was first told to initiate the dialogue process with the DUTA. He then sent a notice to it this morning for a meeting around 12.30 pm, which lasted about an hour. "It appeared that the VC did not come with an open mind and had fixed the meeting under pressure," said sources in the meeting. The administration refused to divulge details about the meeting wherein a host of longstanding issues, including the rollback of the Four-Year Undergraduate Programme, permanent appointments of teachers, implementation of reservation roster in line with the DoPT guidelines, code of conduct on teachers, were discussed. The DUTA represented by its president Nandita Narain, vice-president Sandeep, secretary Harish Khanna and treasurer Bhupinder Chaudhry, also raised problems faced by ad hoc teachers who constitute nearly half of the faculty in DU colleges, the issues of speedy resolution to the CPF-GPF, School of Open Learning, instances of the victimisation of teachers through suspensions, salary cuts, denial of promotion, etc. "We told him that we want permanent recruitment of teachers. The whole method of governance where teachers are terrorised and voices scuttled was taken up. How on slightest pretext teachers are issued show cause notices and suspension order. 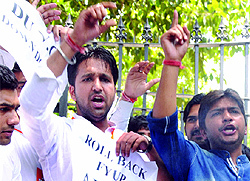 We appealed to him to withdraw the code of conduct," said DUTA office-bearer Bhupinder Chaudhry. On the first day of the admission process for its Four Year Undergraduate Programme, Delhi University (DU) witnessed chaos, mismanagement and even anti-FYUP protests from a section of teachers and students. The online registration and offline admissions were hampered for hours owing to the agitation. At Daulat Ram College (DRC) where administration officials were distributing the forms at the college gate, a protest broke out as students and parents accompanying them were obstructed from entering it. Consequently, the administration stopped the sale of forms for a few hours, but resumed it after Delhi University Students' Union intervened. "There was chaos and confusion at Daulat Ram centre and forms are being sold outside the gate. I and my friends managed to get hold of forms and left," said Anita Sen who hopes to study B.Com. from a North campus college with a score of 85 per cent in the best of four. When asked about the chaos, Prof Malay Neerav, joint dean, Students' Welfare and media coordinator, said, "More than 15,000 people were trying to log in at one time and they were queuing up. Due to semester exams, there was a restricted entry at centres." There were also protests against the FYUP and the Vice Chancellor Dinesh Singh by ABVP, All India Students Association and Democratic Students Organisation. The impact of the storm was so devastating that 370 trees along the PWD roads and in government building complexes were uprooted. This affected the flow of traffic on 29 major roads. "Thirty teams of PWD comprising nearly 300 people were deputed for cutting and removing trees and clearing the roads. The teams started working immediately after the storm and worked round the clock. After the well-coordinated operation, the teams have been able to clear all the roads and have ensured smooth movement of traffic on these roads," said a senior Delhi government official. "The trees which fell in the government building complexes and Green Belt are being cleared now and the work is likely to be completed tonight," he said. The roads affected included Ridge Road, Shankar Road, Outer Ring Road, Jail Road, Rohtak Road NH-10, Road No. 71 (near Yamuna sports complex) and many others. Swift operation was required to restore the normal flow of traffic. The department will take up plantation in the ensuing monsoon season to compensate for the trees lost due to the storm. Former Congress MLAs, including Arvinder Singh Lovely, met Lieutenant Governor (LG) Najeeb Jung to discuss the issues of shortage of power and water besides sealing of household industries and readymade garment units by the municipal corporations. The leaders submitted a memorandum to the LG which pointed out that power cuts ranging from 10 to 12 hours were being imposed, particularly in unauthorized colonies, villages, JJ clusters and resettlement colonies. Lovely said that people have been forced to drink dirty or underground water, threatening the outbreak of diseases. "The Congress party also registered its protest at the long power cuts, particularly in West and South Delhi areas. We requested the LG to identify such areas and make water supply available through water tankers," Lovely said. The Medical Superintendent (MS) informed the LG that the hospital was in the process of installing biometric attendance for its 4,000-strong employees in a phased manner and by 1 July, all the employees will come under the ambit of this system. The MS made a presentation to Jung in which he stated that the hospital had put into service nine stretcher-bearers from St. Johns Ambulance to aid the existing operations and also deputed five patient welfare officers from Delhi Health Services to ensure that the patients were guided properly at the time of registration. During his visit to the hospital, the LG had noticed that patients were not being helped at the time of registration. This new service is meant to fill that gap. Jung instructed the officials concerned to complete the new OPD block by June 30. The work is being carried out by the Public Works Department. The MS stated that the hospital is also exploring the possibility of providing additional parking facility by demolishing an old doctors' mess. The Commissioner (MCD, North) informed Jung that 85 unauthorized vehicles had been removed from the site to create additional space. Jung instructed the Chief Executive Officer (DJB) to give extra water to the dialysis unit. "The dialysis facility is a critical facility and water supply to it must be on top of DJB's agenda," Jung said. He advised the MS to explore the possibility of water harvesting as also recycling. The issue of unauthorized vendors and squatters was also highlighted in the meeting. Instructions were issued to the Commissioner (MCD, North) and Special Commissioner of Police (Traffic) to carry out daily operations to ensure that the passage for emergency vehicles and services are unobstructed. The police have arrested one of the accused, who is the victim's neighbour. The other seven are also his neighbours. The victim lives with his family at Geeta Colony. "It is alleged that the victim was sodomised eight times. The first instance took place in the beginning of May. At every instance, he was sodomised by one accused," said a police officer, privy to the details of the case. The officer explained that on May 27, the victim's father confronted some of the accused with the matter at Geeta Colony. A scuffle took place between the two parties. The police received a call about the fight at the locality. They registered a case under the Indian Penal Code (IPC) section 323 (punishment for voluntarily causing hurt) at the Geeta Colony Police Station on the same day. "We investigated the cause of the fight and learnt that the victim had been sodomised. We examined the boy and registered a case under the IPC sections 377 (unnatural offences) and section four of the Protection of Children from Sexual Offences (POCSO) Act on May 28," said the officer. Section four of the POCSO Act is "punishment for penetrative sexual assault". The police arrested one of the accused and are looking for the others. The two men who have been apprehended by the Delhi Police are identified as Mandeep, alias Monu (24), and Jitender, alias Jitu. They are working with private financial companies. According to a police officer, Jitender became part of the abduction plan because he wanted the money to marry his fiancée. The police caught the two men when they traced Mandeep's mobile phone location to a house at Ganesh Nagar in East Delhi. Jitender's fiancé was also present in the house when the police caught them. The police said that they are investigating her role in the case. On May 31, Mandeep's brother Sandeep informed the Karol Bagh police station that Mandeep had left his house about 11 am on the same day, but never returned. When Mandeep's family tried contacting him, his mobile phone was switched off. "About 8.30 pm on May 31, Sandeep received a call from Mandeep that he is on a railway track at an unknown place and some criminals are going to kill him. Sandeep informed the police about the call. Then on Sunday, Sandeep received several calls on his phone in male and female voices from a mobile phone, directing him to arrange Rs 5 lakh for his release," said Alok Kumar, Additional Commissioner of Police (Central District). The police subsequently registered a case of kidnapping for ransom at the Karol Bagh police station. The police started tracing Mandeep's mobile phone location. The location of his mobile phone was continuously found near Ganesh Nagar. They tracked the culprits to house No. 57 at Ganesh Nagar-II. "We found Mandeep and Jitender in the house with a girl, who was Jitender's fiancee. The mobile phone was also recovered from there," explained Kumar. "Mandeep has to repay loans of Rs 3 lakh, which he had lost in share trading. He had taken these loans from his acquaintances, who were regularly directing him to return it. About five days ago, he hatched a plan of his own abduction with Jitender and placed ransom calls to his family," said Kumar. Mandeep allegedly roped in Jitender with the promise of giving him 40 per cent of the money. "Jitender took him to his rented place in Ganesh Nagar and arranged a mobile phone which had the software of converting a man's voice into the voices of a woman, an old man, a child and a robot. Mandeep used the phone to make ransom calls of Rs 5 lakh to his brother by changing his voice between a man and a woman," said Kumar. The accused identified as Chandra Shekhar belonged to Kanpur. He had picked up the child of a passenger who was asleep at the platform of the Anand Vihar Railway Station. However, when this man tried to come out of the station, he was arrested and the child recovered. Two art exhibitions, combining scientific temperament and artistic sensibility, titled 'Impression to Expression', were showcased in the national capital region by two artists. A show of abstract art works inspired by nature at all levels of scale, cosmic as well as nano particle, was put up at Triveni Kala Sangam by Mita Brahma. The work is inspired by the flow of energy and the patterns visible in nature. "It is the complexity, energy and joyfulness of growth and movement in nature that I try to capture in my work," said Mita who is an alumna of IIT Delhi. The other exhibition is a set of paintings which is the artist's expression of whatever she sees around her. Radha Kumar, a science graduate from Delhi University, said that her paintings are depiction of emotions that a person experiences in day-to-day life. "Art is an ongoing journey and there is beauty in everything around. My paintings are reflections of my thoughts and emotions," she said.